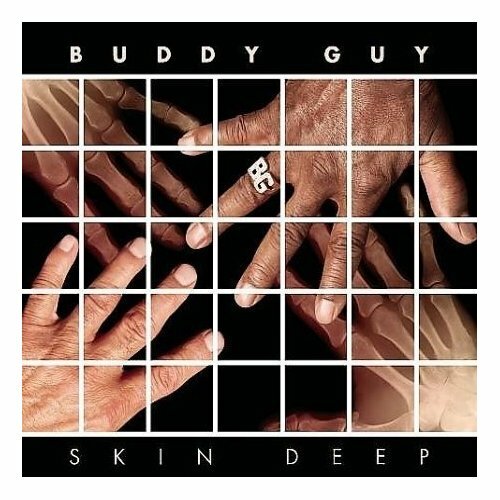 From the opening wah-wah chords on Buddy Guy’s new release, Skin Deep, the legendary guitarist demonstrates why he’s been an influence on Eric Clapton, Jimi Hendrix, Jeff Beck and numerous other blues players on the south side of Chicago. While he often professes reverence for his role models, B.B. King and T-Bone Walker, the torch was passed long ago when it came to guitar heroes. What’s hard to understand is how, at age 72, Guy hasn’t exercised more creative control before now. In press materials accompanying this album of all original material (he wrote or co-wrote seven of its 12 tracks), he claims this is the first time he’s had such freedom and control. Better late than never. This is a fun, down deep and dirty album from start to finish. Skin Deep takes listeners back to the traditional blues Guy has been identified with for nearly a half century, after a recent series of otherwise fine albums whose only flaw was their occasional leanings toward catering to guest performers—such as Carlos Santana and John Meyer—and their fan bases. While Guy is again joined by esteemed guest performers on Skin Deep—including Susan Tedeschi , Derek Trucks, Eric Clapton and Robert Randolph—their collaborations pay genuine homage to the blues genre. A good example of this is Randolph’s searing steel pedal guitar performance on the sixth cut, “Out in the Woods,” which Guy penned and says hearkens back to one of his signature songs, “The First Time I Met the Blues.” Guy literally was born in the woods of a plantation near the small town of Lettsworth, Louisiana. Today, as a survivor, “with wolf blood in my veins,” he takes Randolph and the listener back in place and time to the swamp where “the crocodiles and the foxes and the grizzlies, they all know me by my name.” The interplay between the two guitarists vividly conjures the imagery of rattlesnakes and alligators of his sharecropping youth that he sings about. As you hear Guy and his guitar growl, believe it. Age can bring wisdom and Guy’s reflection on the wounds of racism, the title cut “Skin Deep,” may have simple message, “underneath we’re all the same,” but Guy’s soulful delivery makes one take pause to ask why more people can’t apply this simple truism. Interestingly, Guy says the inspiration for the song was his being reunited recently with a white childhood friend whose parents had cut off their relationship as teens. Much can be written about the interplay between Guy and his protégé, Clapton, but on perhaps one of the most interesting cuts, Guy raises a question about the ones who make the blues: “Who’s Gonna Fill Those Shoes?” After presenting a review of those who came before him in the blues pantheon, Guy turns things over to up-and-coming pre-teen guitar phenom Quinn Sullivan. One of the last of his generation, Guy learned at the feet of Otis Rush and Muddy Waters. He doesn’t answer the song’s question but allows the youngster to give us something to think about. By the time you get the closing track, “I Found Happiness,” you believe Guy when he says that he has. This entry was posted in Blues and tagged Modern electric Chicago blues by aaamc. Bookmark the permalink.